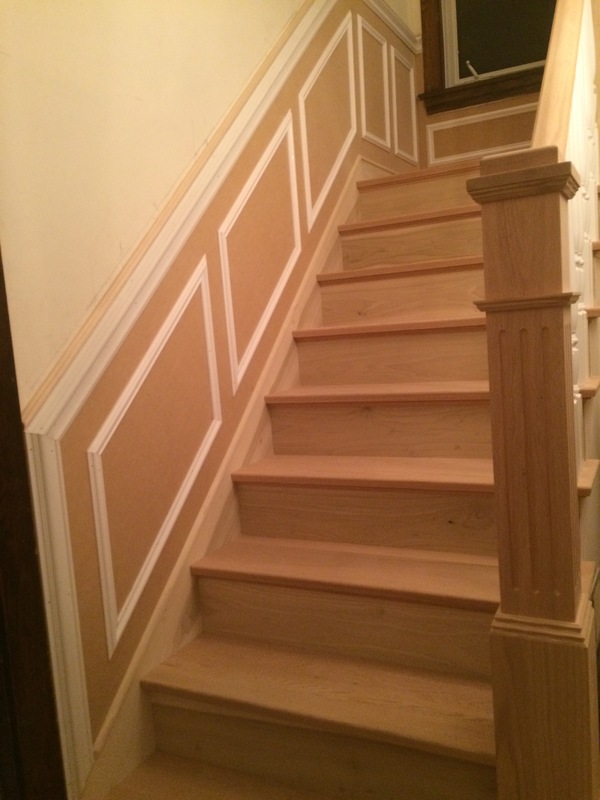 Finishing this downstairs hallway took forever because it had so many elements. 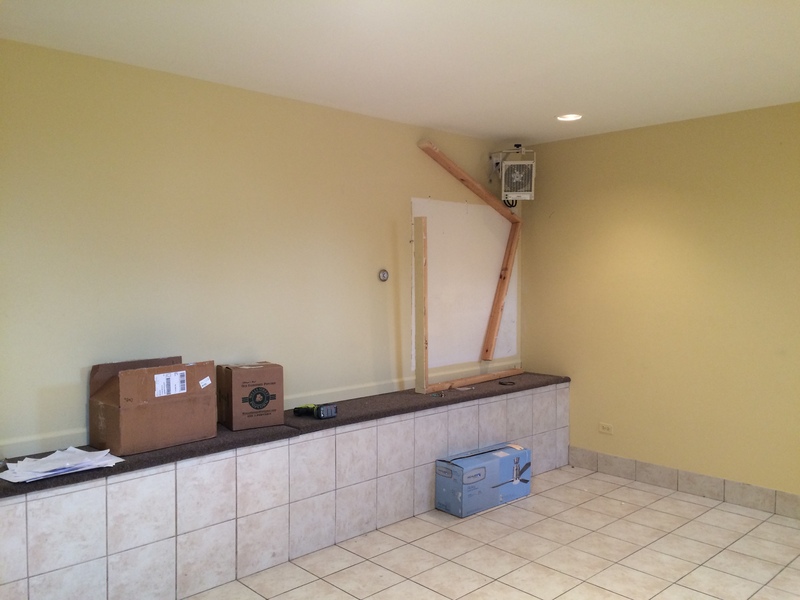 We had to wait for electricians, carpenters, floor guys, drywallers and painters to each take their turn before we could swoop in. 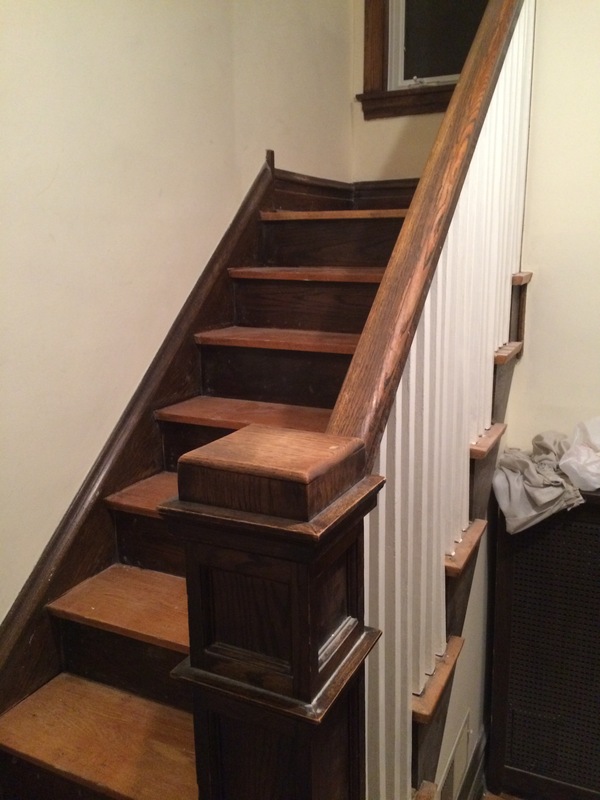 We do most of our own painting, but the staircase was just too high stakes for us to take it on ourselves. 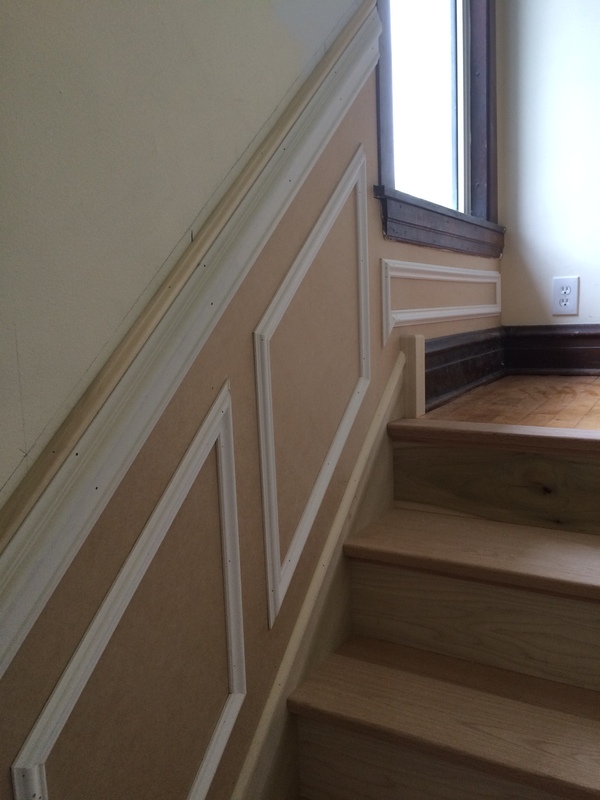 We hired a professional painter to do the paint/stain combo on the staircase and to paint the wainscoting. It was totally worth it. 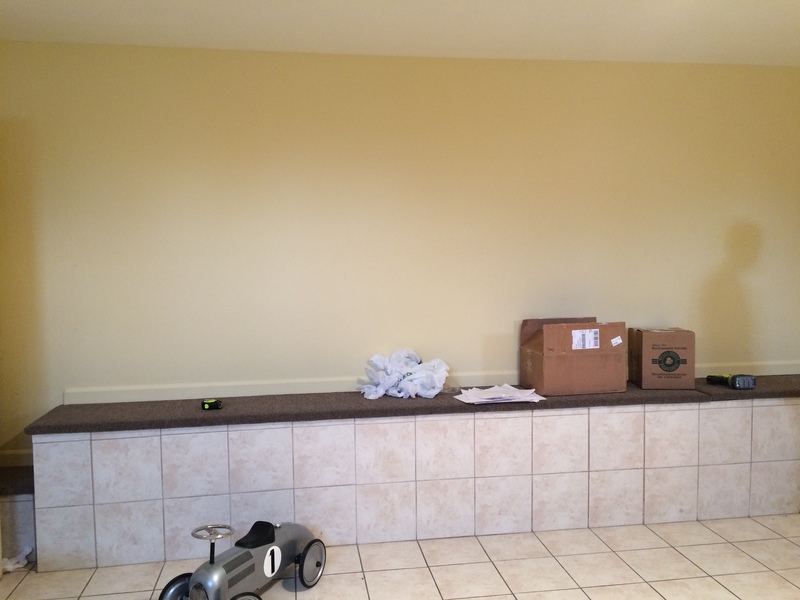 The walls in the hall are uneven and are not in the greatest shape. It’s an old house; that’s not a surprise. 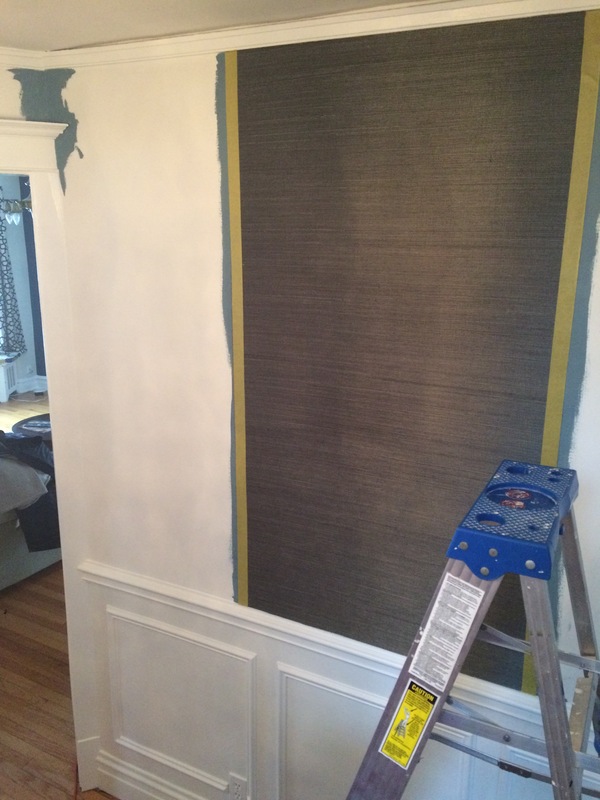 I wanted to do something to mask those flaws, so I chose grasscloth to go above the wainscoting. 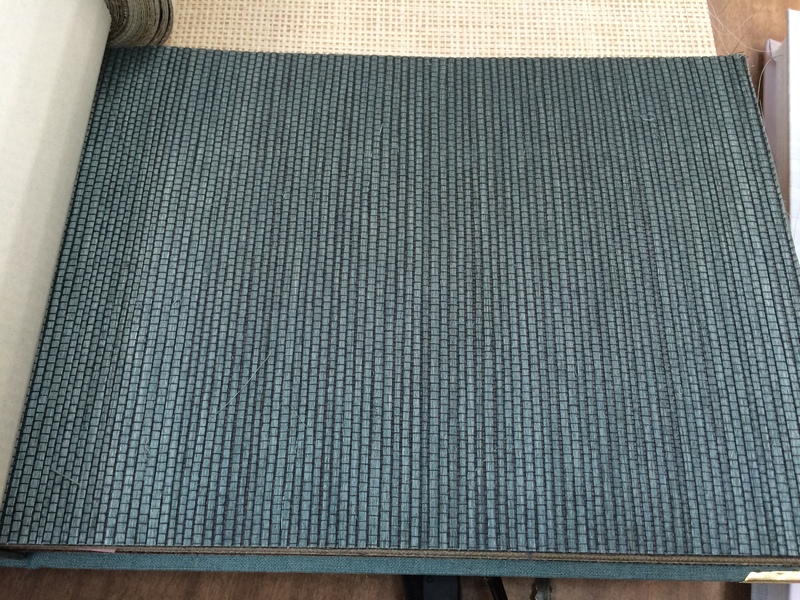 I am kind of obsessed with grasscloth, but it can be overwhelming in a large room. The hallway was the perfect spot. 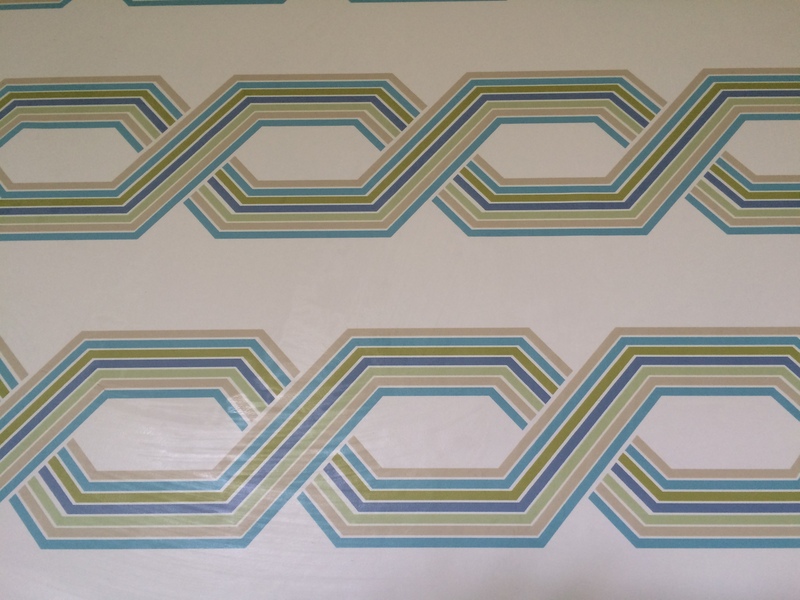 My parents bought it for me for my birthday (you know you’re a grownup when you’re thrilled to get wallpaper as a gift) and my mom, who used to have a wallpaper business, also did all the labor. 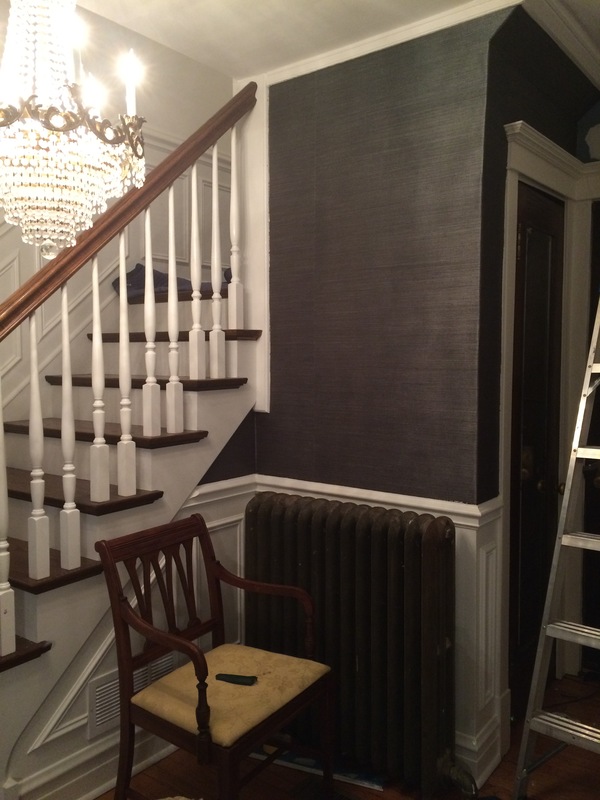 The walls are very tall in the stair landing and grasscloth is heavy and tricky to put up all in one piece. 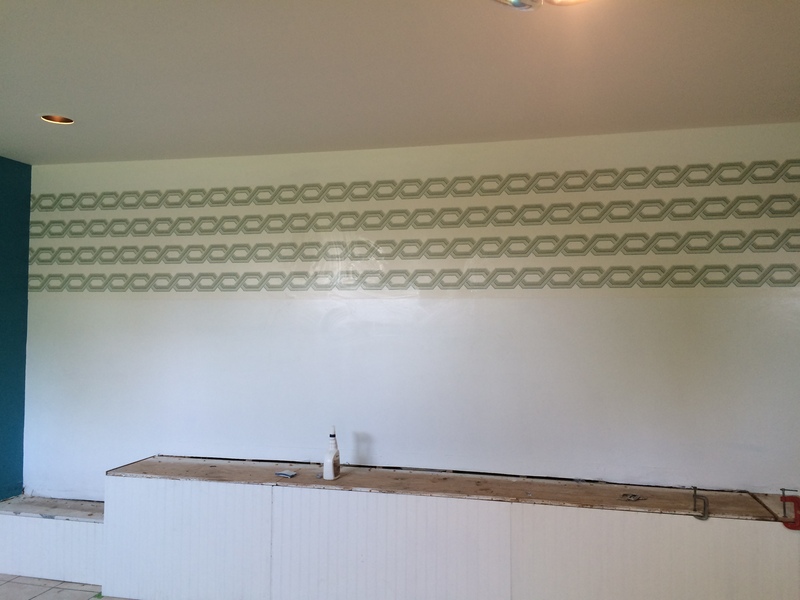 My mom did an amazing job, and though she was highly satisfied with the results, I don’t think she’s dying to work with grasscloth again. There’s the preview. Full reveal in the next post. 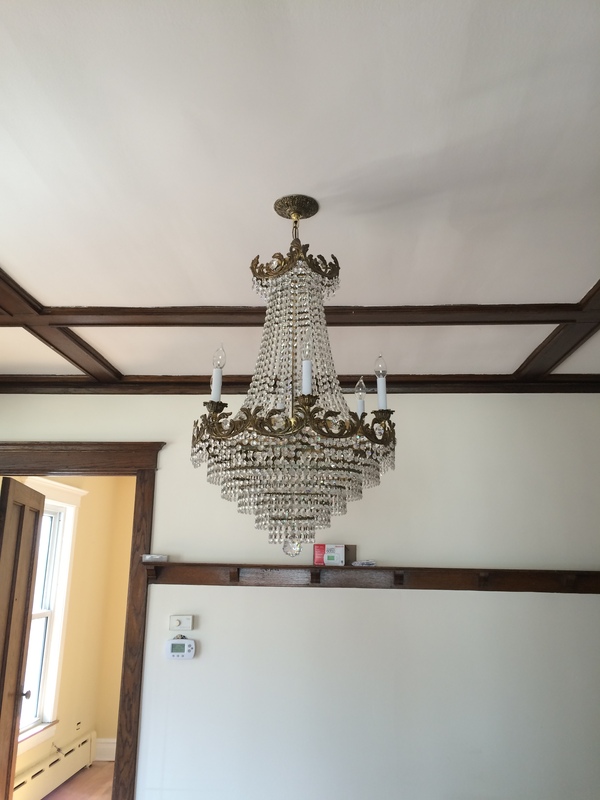 They were covered in drywall dust from the wall patching, and they had lost many crystals over the years. 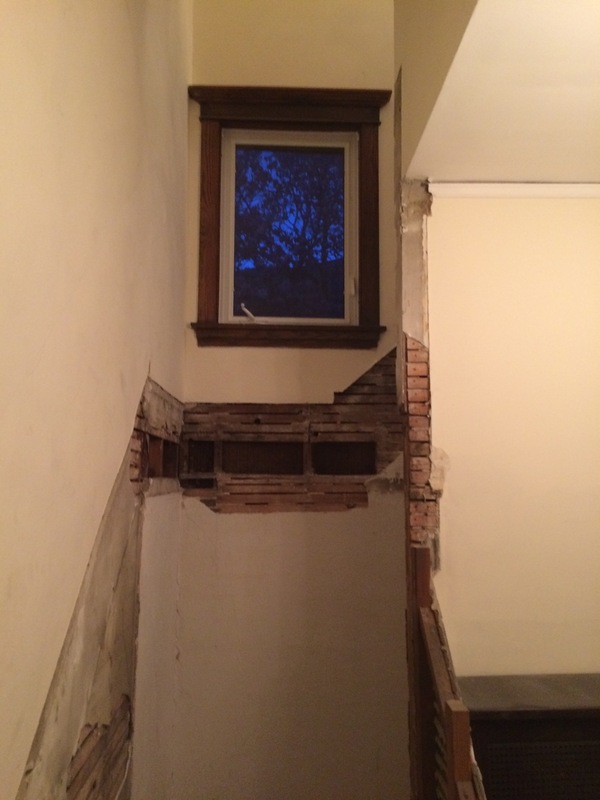 I wish I had taken before pictures, but this was all going on in the midst of the staircase drama, and I forgot. Oh well. 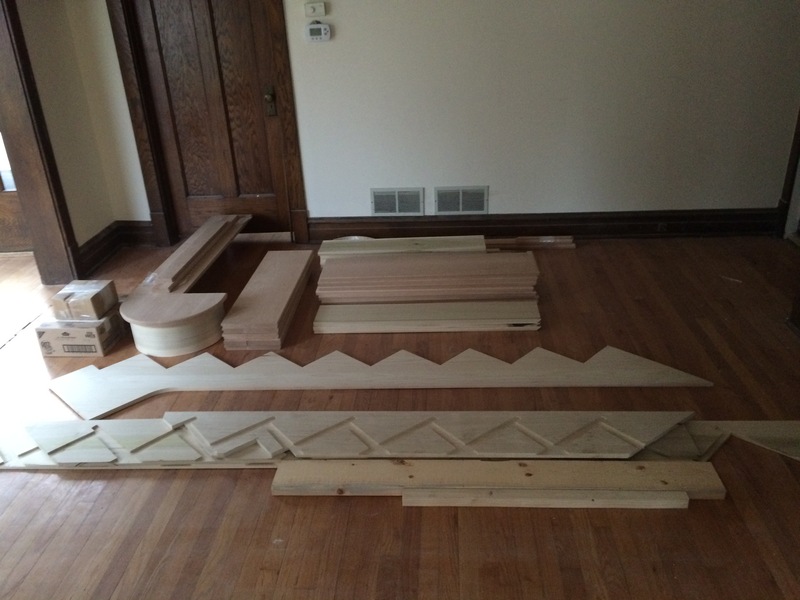 Andy excels at projects that require patience and persnicketiness, so this was all him. (I possess neither of those qualities, so I stayed out of it. Impatiently.) 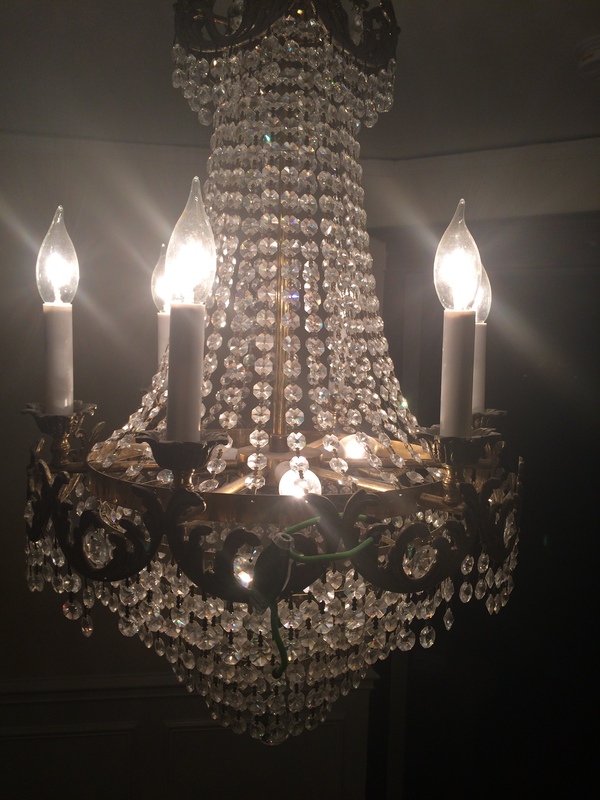 Electricians removed the chandeliers from the ceiling, and we placed each in its own box to keep the crystals separate. Then he thoroughly cleaned them with 10 percent vinegar solution, which significantly brightened them up. Next he tracked the pattern (the number of crystals per row) to determine how many were missing. A little less than half of the crystals were missing overall — the pattern had been altered over the years, and each had been cannibalized to fill in missing pieces for the other. Andy ordered replacement crystals online and bought matching hardware to connect them. 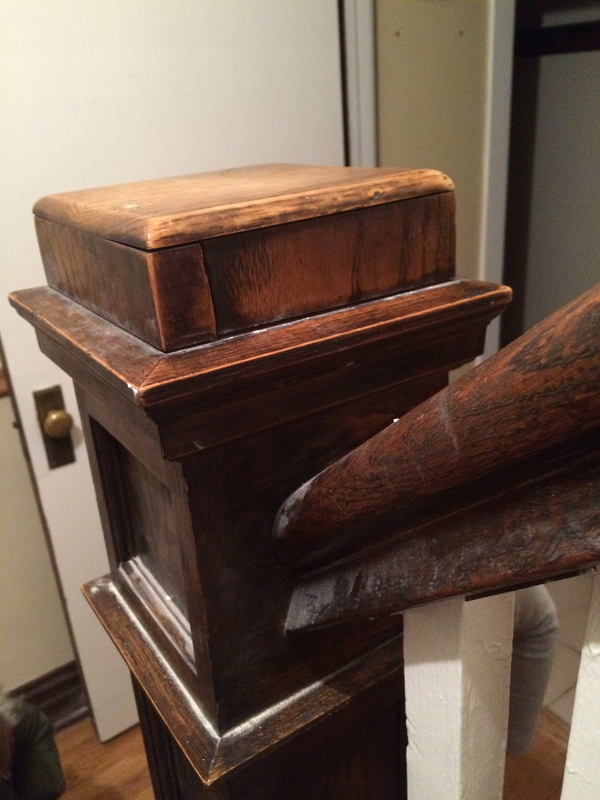 The problem was that the new hardware looked really brassy and new, while the old hardware had an aged patina. To get them to match, Andy exposed the new hardware to alternating solutions of ammonia and vinegar until it was appropriately aged. There was no science to this — just trial and error. 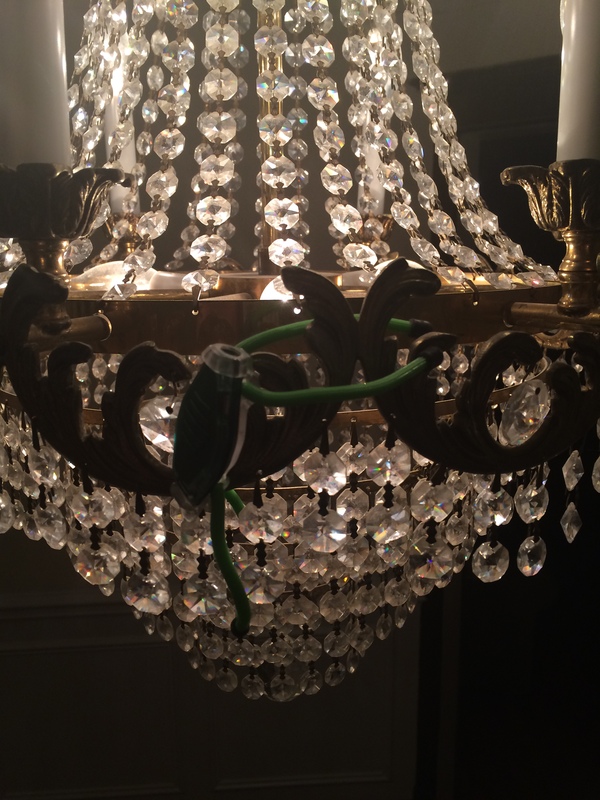 Andy was painstakingly hanging the new crystals onto the chandeliers in the basement while the flooring guys were doing the patch job at the bottom of the stairs. He was doing so while wearing his painting clothes, which a common hobo would reject as too sloppy. You don’t. You just live that dream on the side. 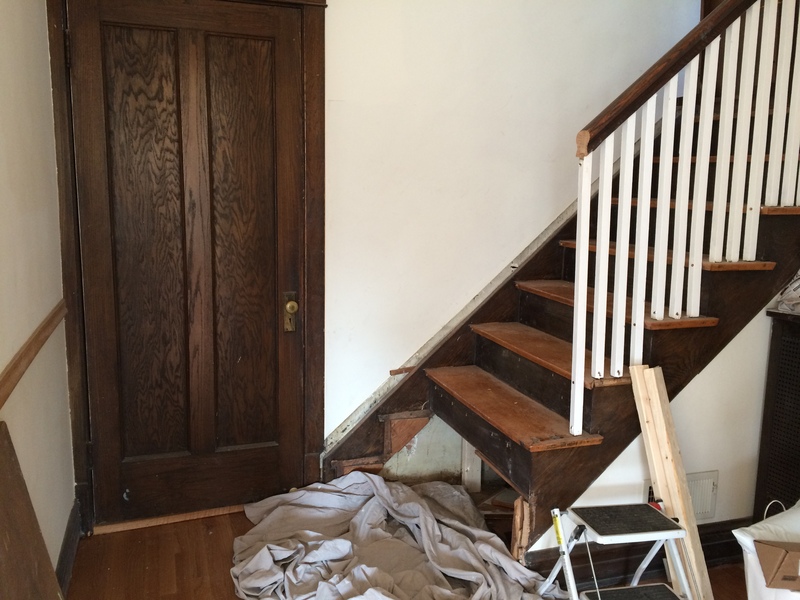 Quick bonus post: Part of the staircase renovation necessitated remodeling the hall closet a bit. 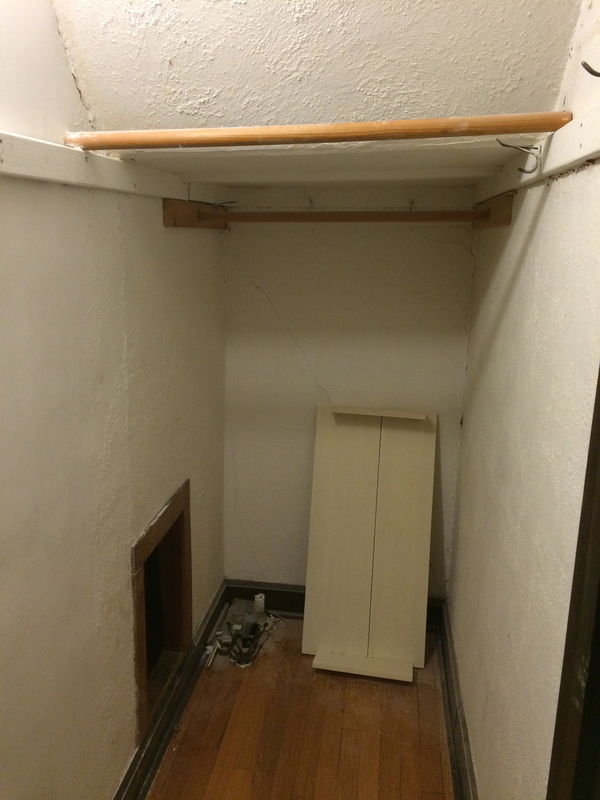 The closet had this little opening on the left that led to extra storage under the stairs. The Harry Potter area, if you will. Should my sister ever be murdered by an evil wizard, I know just where to keep her children. 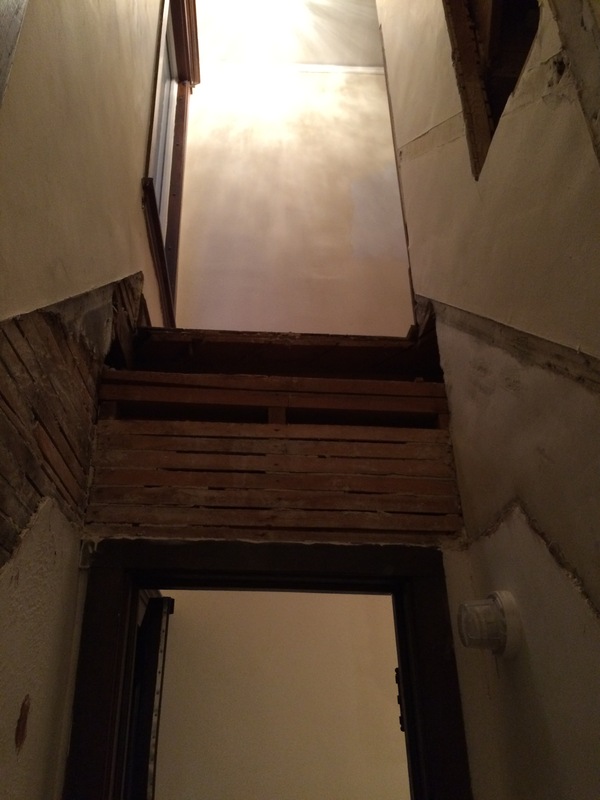 We would never have bothered to change any of this, but it all had to be torn out to accommodate the new stairs, and there was no compelling reason to re-create this weird tiny opening. 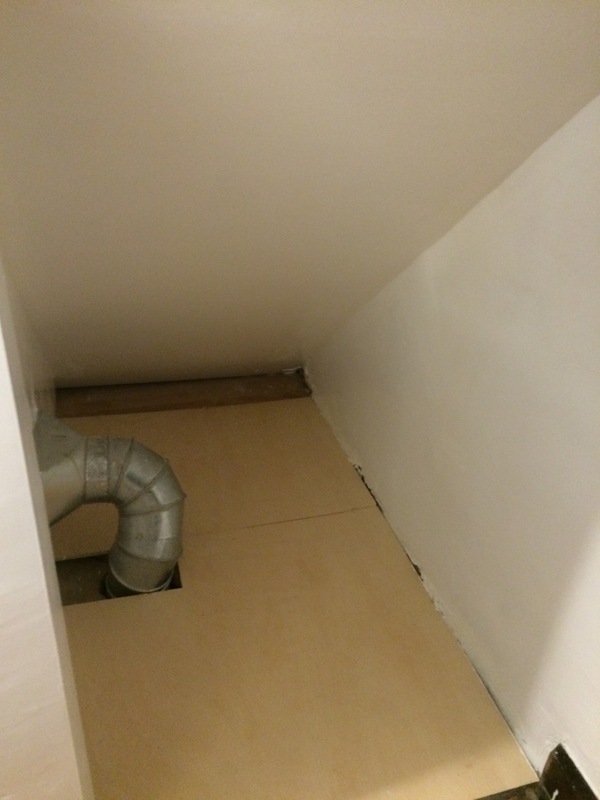 Instead we opened it all up and now we have this huge area under the stairs that we can access for extra storage. It was very handy for Christmas gifts, and there’s still plenty of room for boy wizards. 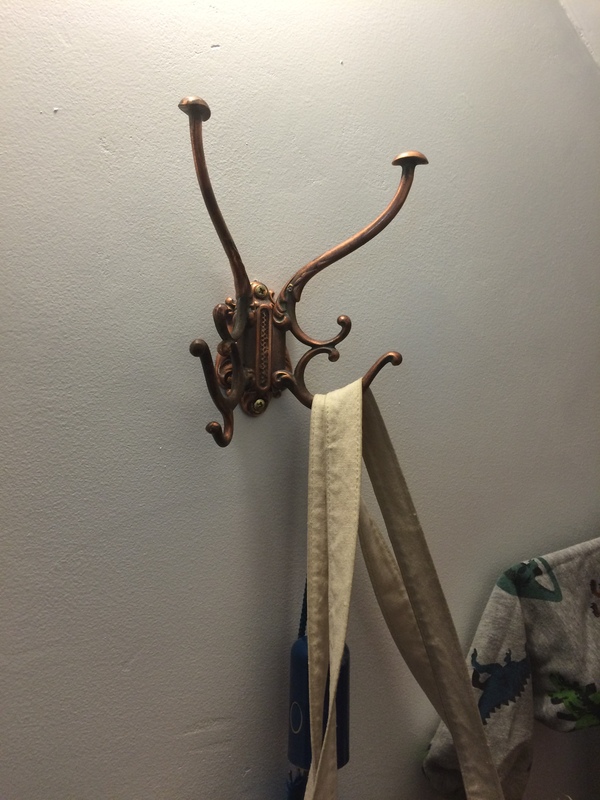 And as a bonus, the carpenter uncovered the original coat hooks that we polished up and restored to their rightful home. 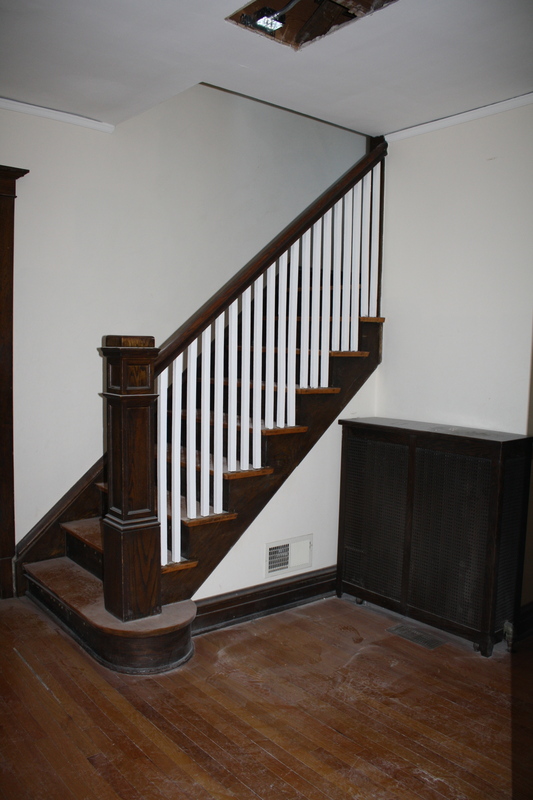 The staircase was built by an expert carpenter who did a truly amazing job. 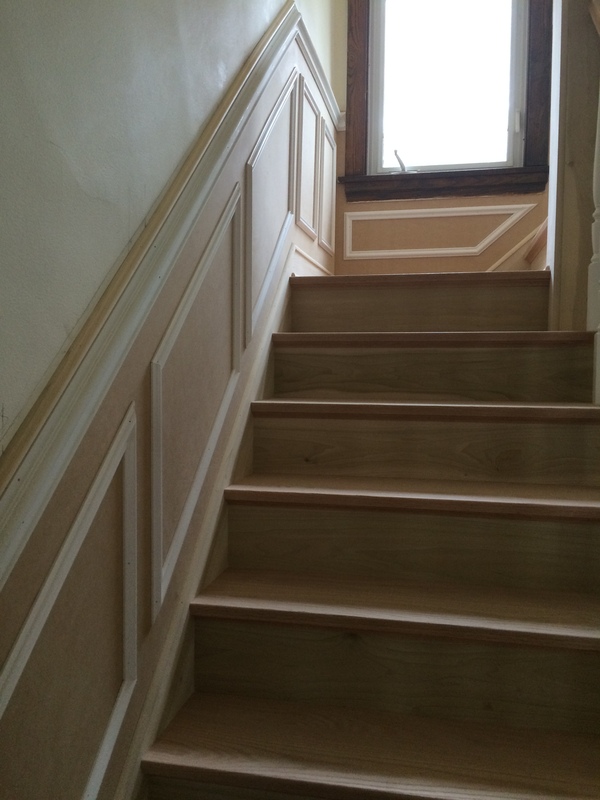 Every other tradesman we’ve ever had in the house has commented on the craftsmanship of the stairs. And here, in hat-haired glory. 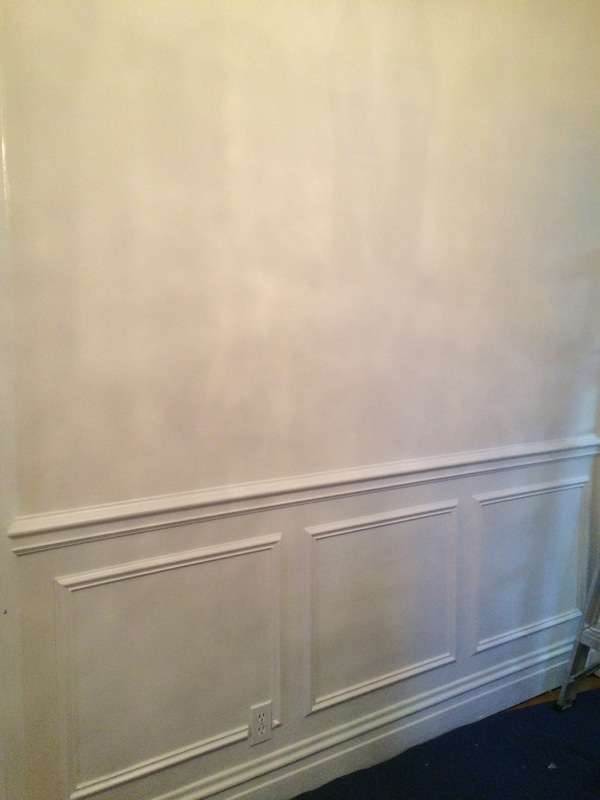 Once we got to this point, we decided to add wainscoting as well. 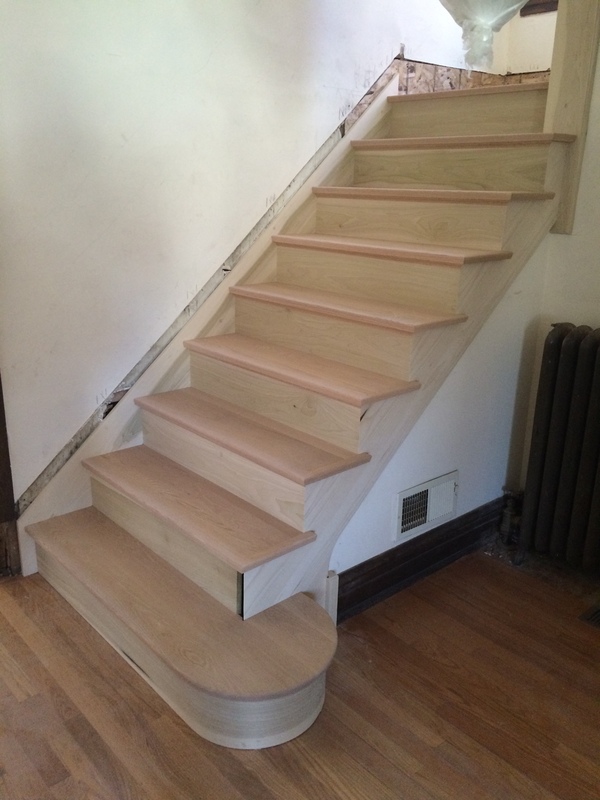 Maybe we were just drunk with relief from having a functional staircase. Plus, once you’ve already dropped a ton of money on an unexpected, soul-killing project, you want to get yourself a little somethin’ special. Here’s that element layered in. 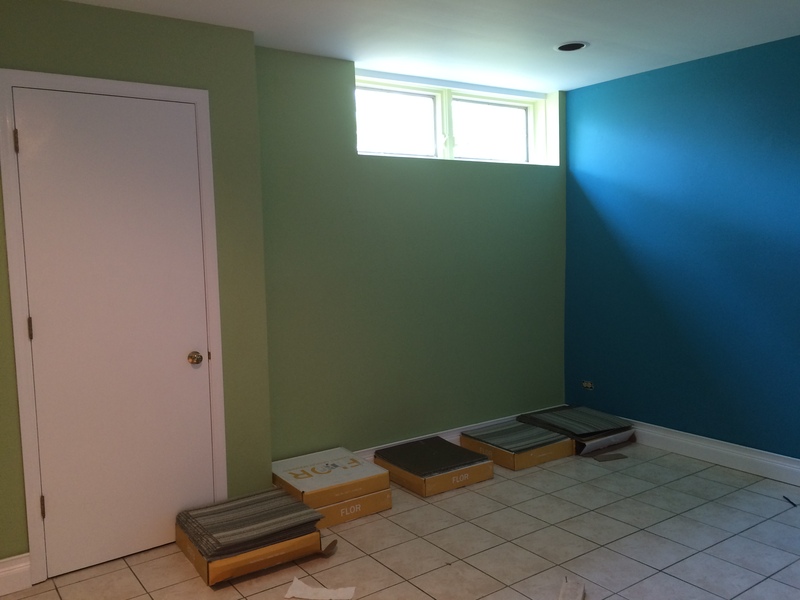 Once everything was built (which took about seven weeks from ordering the parts to installation), it was time to paint and decorate. 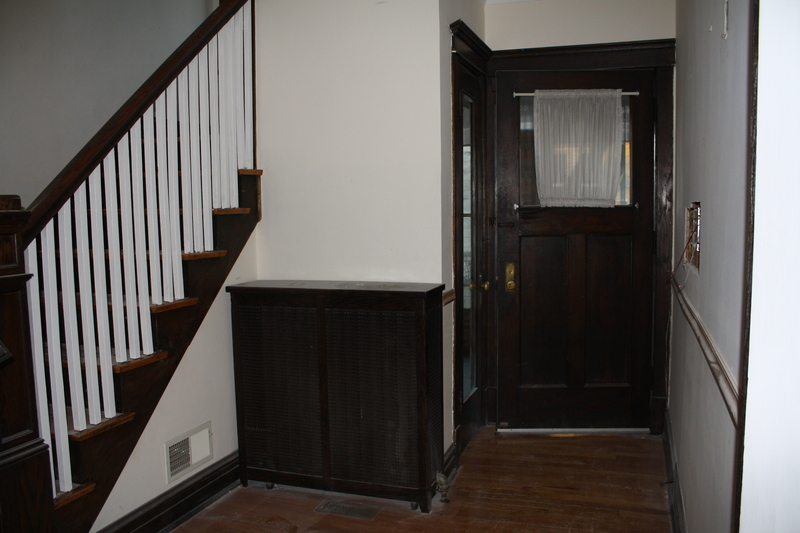 The house was built in 1913 using the carpentry techniques available at the time (duh). This did not, as it turns out, include glue. 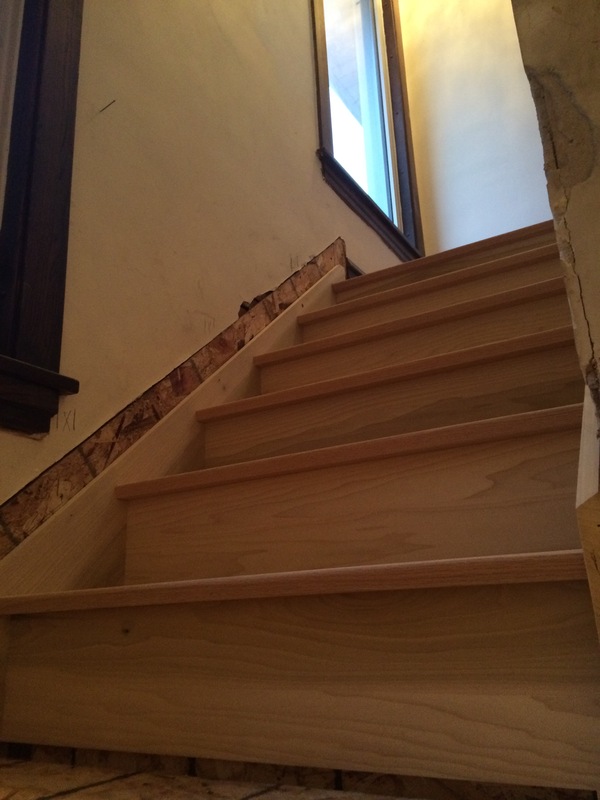 So each stair was held up by supporting wood pieces that stretched from the edges of each tread down to the floor. 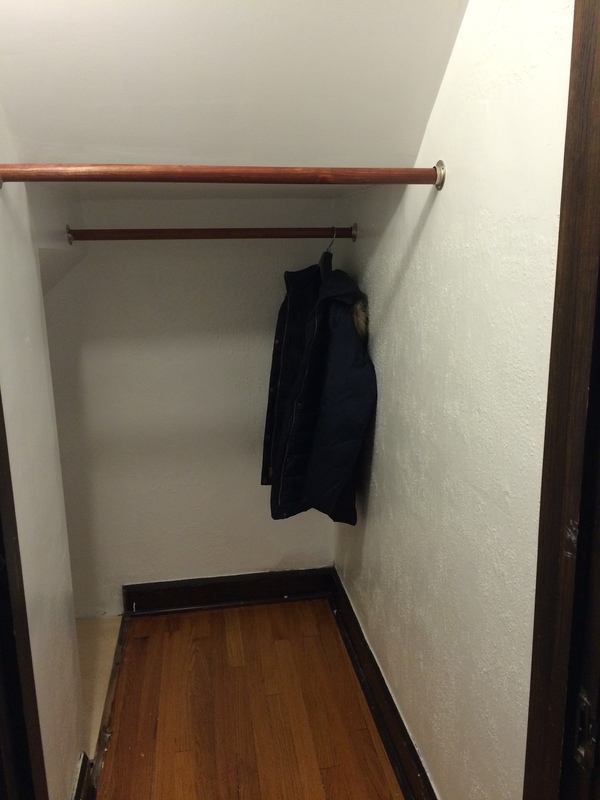 This is an elegant system when the fit is perfect, which it probably was 103 years ago. That support had eroded over the intervening years, which worsened as the house settled. When we shone a flashlight under the stairs, we saw that most of those supporting pieces were just laying on the ground. 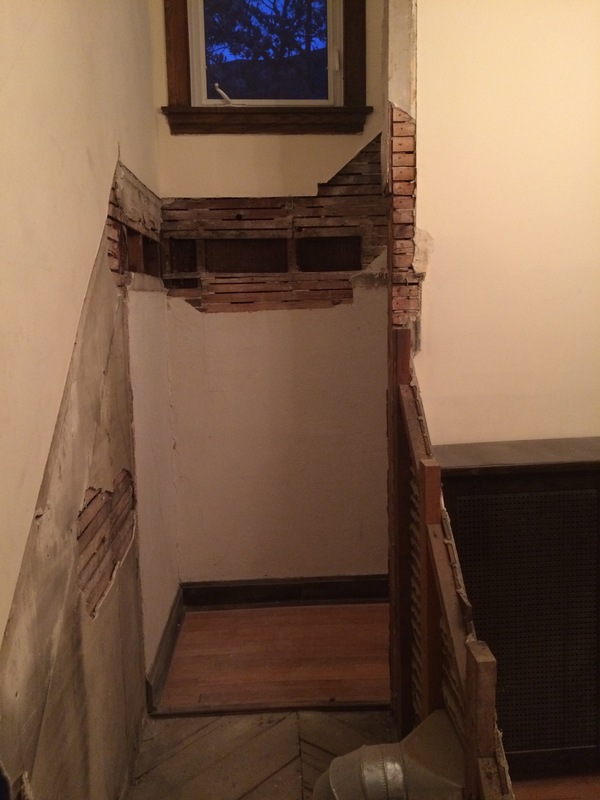 The stairs were sagging, tilting and pulling away from the wall. 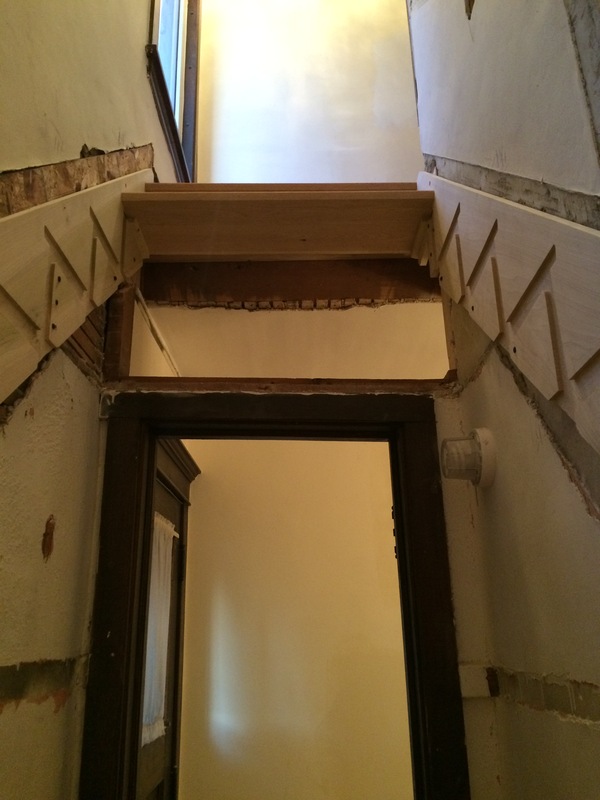 Long past the point where a repair could save the staircase. 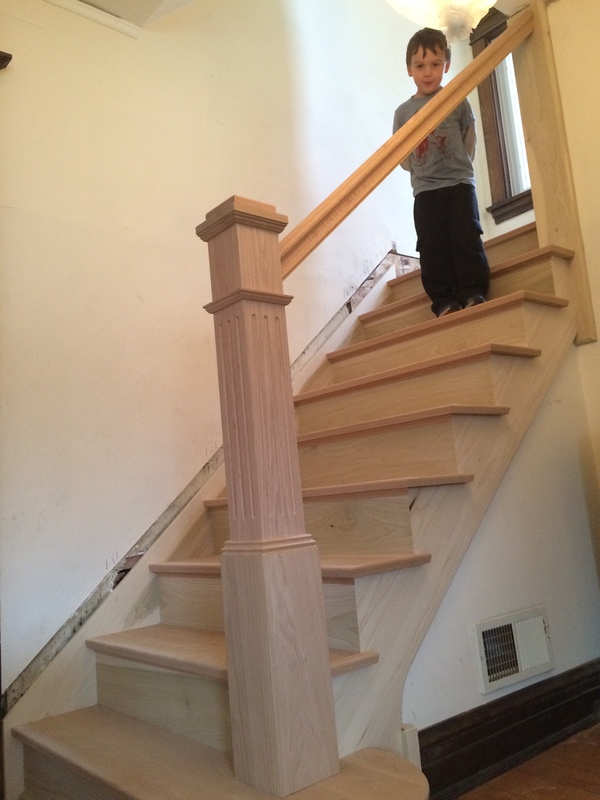 This was a huge drag because it was an unexpected expense, but after whining and sighing to each other for a while, we sucked it up and moved forward with replacing the staircase altogether. 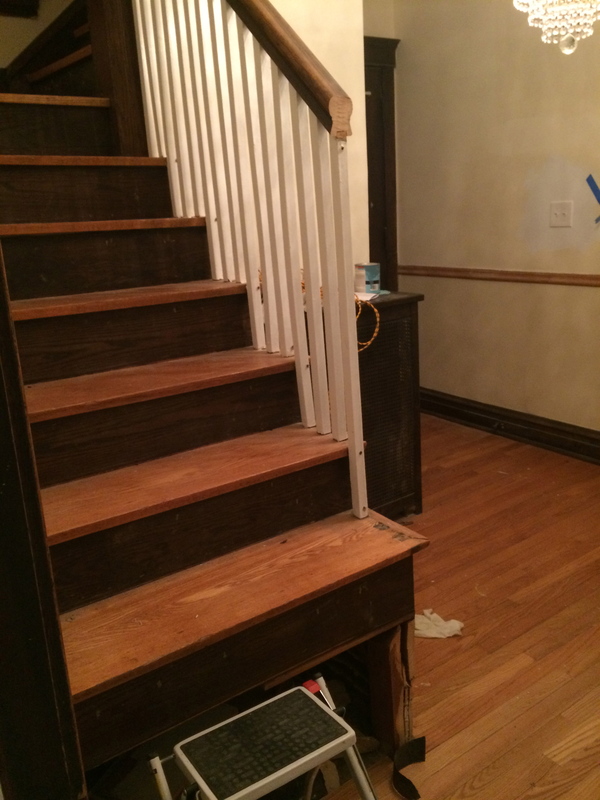 We started by taking out the bottom two stairs so that we could have the flooring patched and altered to support the new setup. 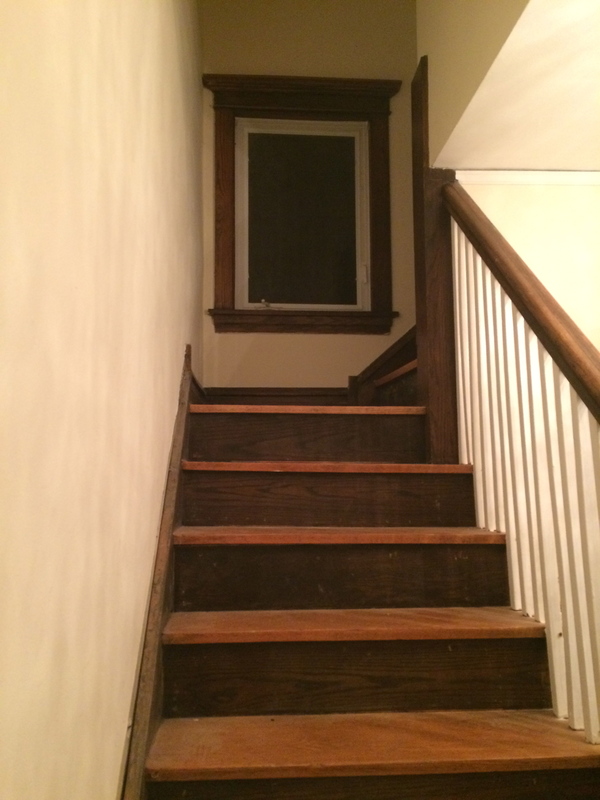 We had to use this step ladder to get up and down the stairs for a while. Fortunately we hadn’t moved into the house yet. 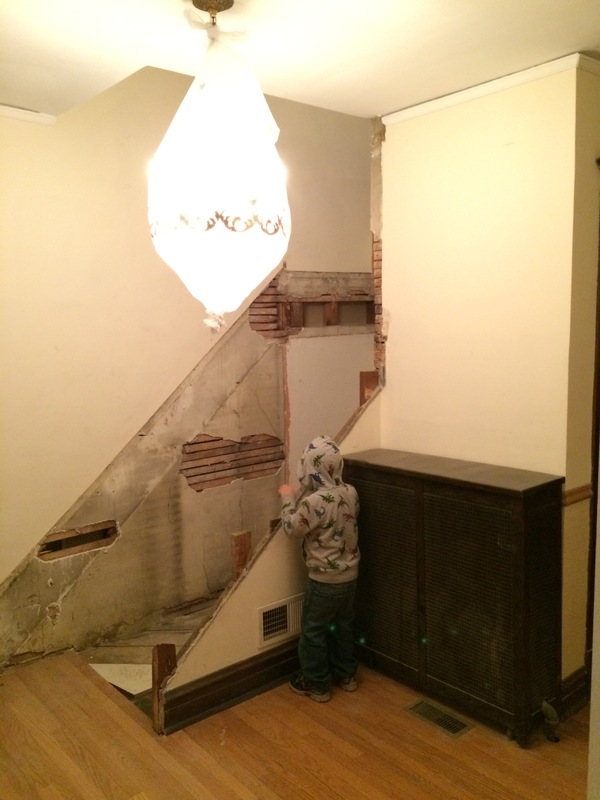 Then the whole shebang was ripped out. Here it is, all gone. 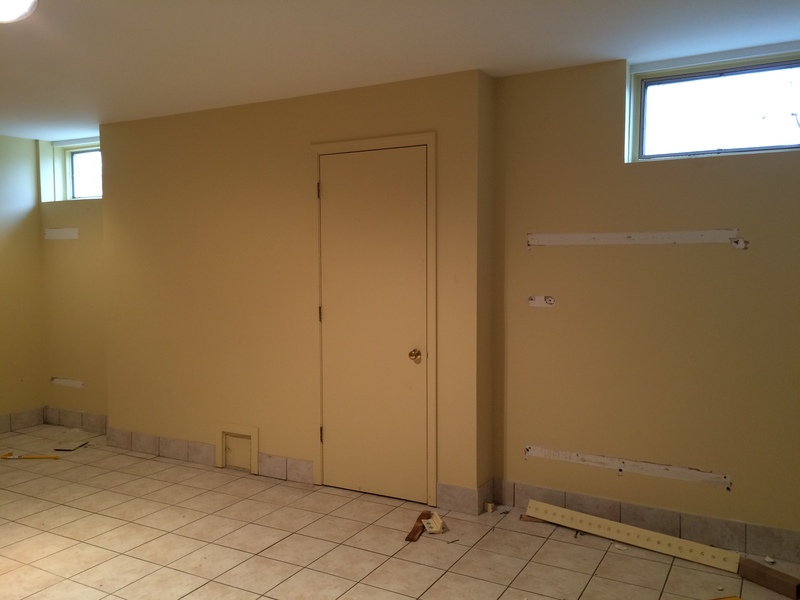 The flooring in the back is from the closet. Crazy, right? It was a shocking sight to behold. It looked so stark and bare. Luckily it wasn’t like this for long. 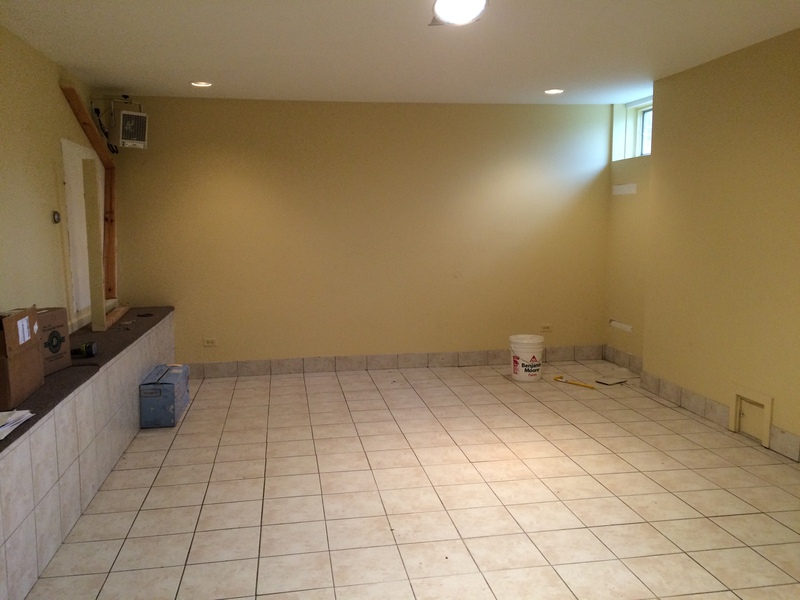 The basement playroom ended up being a huge transformation if only because covering the tile made the room look entirely different. Here’s the final reveal. 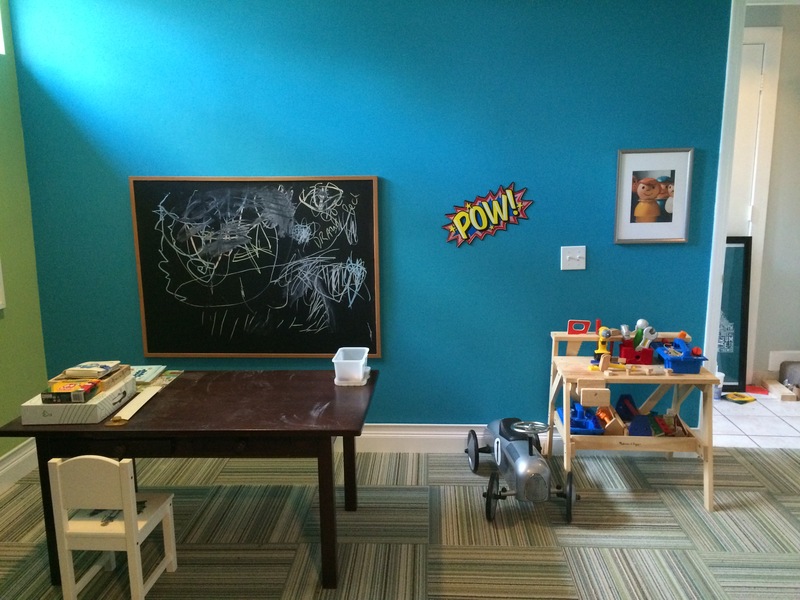 The cork board in the art corner here was a project we completed for the kitchen in our old house, and we moved it to the play room to display the kid’s work. Full instructions can be found here. The print next to the door is from ArtStar, which is a great Web site that promotes affordable, collectible art. 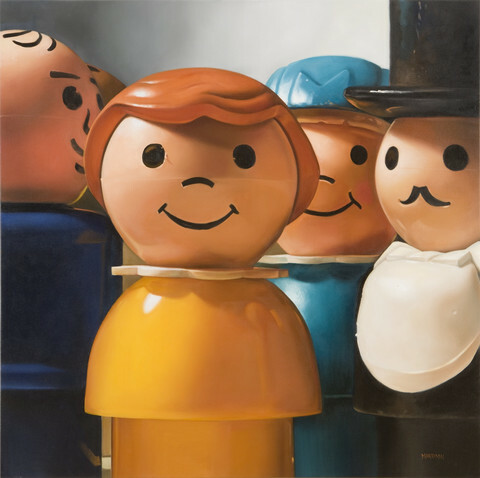 The Little Collector portion of the site is entirely devoted to kid art, including this portrait of Fisher Price Little People. Every adult who walks into the room asks about it. Some find it hilarious; others find it to be “dead-eyed.” I love it. 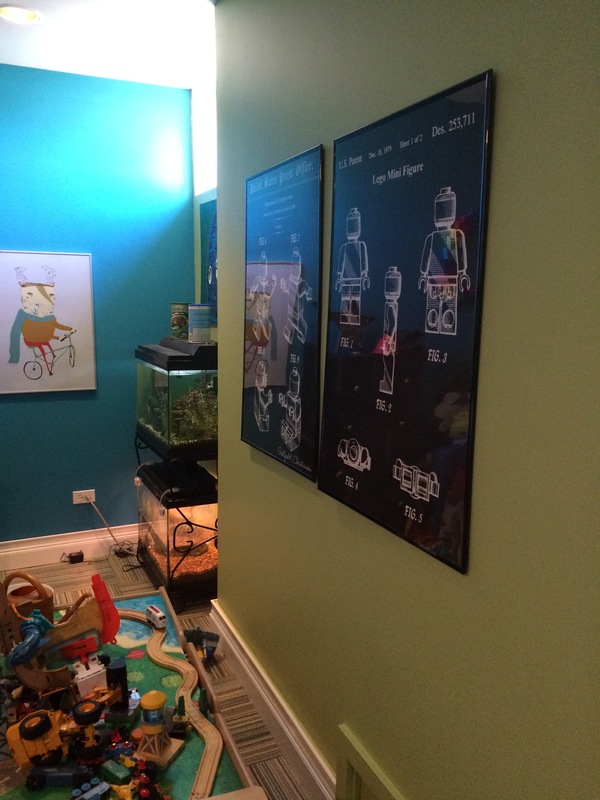 The other piece of art that I really love in the room is hard to see in the shots because the frame is so reflective, but it’s the patent drawings of Lego minifigures. 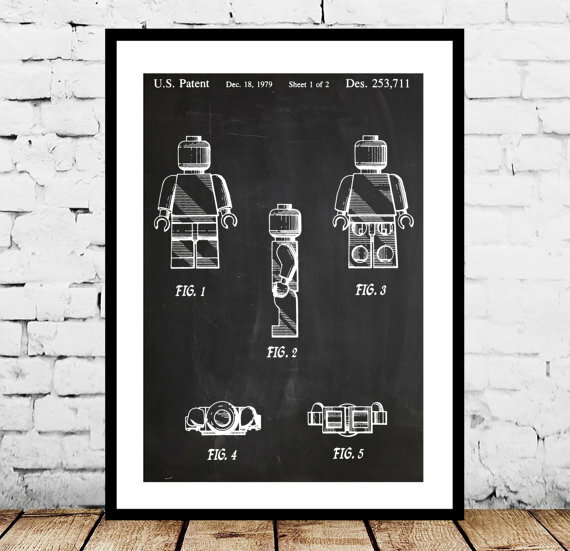 Available from Patent Prints and Eye Catching Patents. 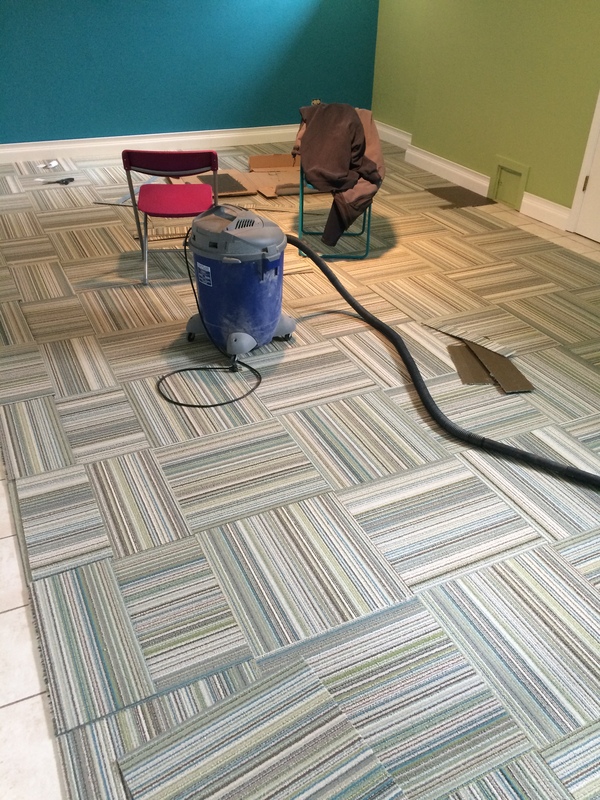 The ceramic floor tile made the room feel cold and unwelcoming. 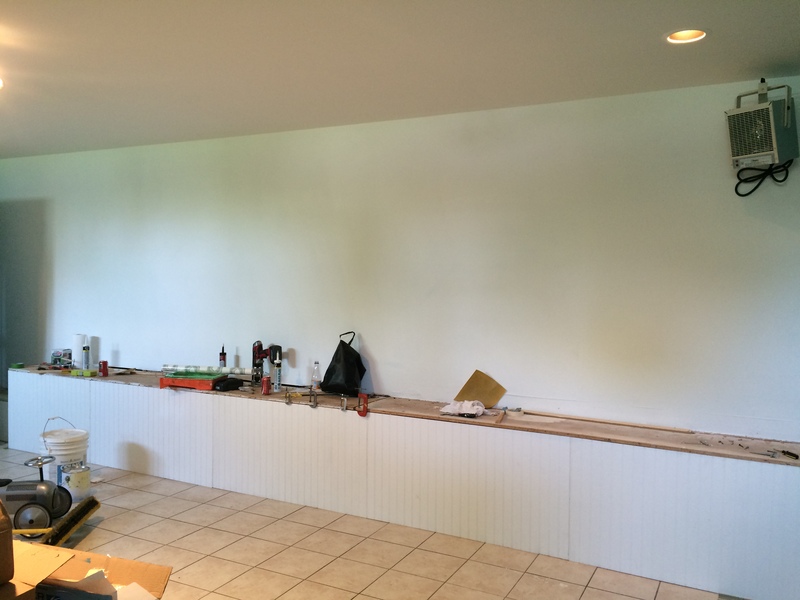 Unfortunately, it also wrapped up along the wall to act as a baseboard, so it would have been unnecessarily complicated to rip it all out. 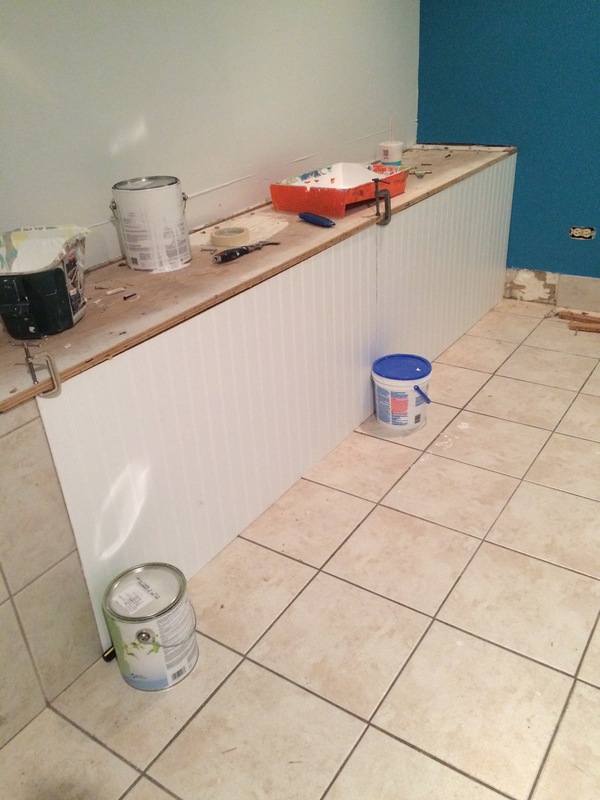 (Guess how I know–Andy removed one of the baseboard tiles and it took half the drywall with it. Plan aborted.) 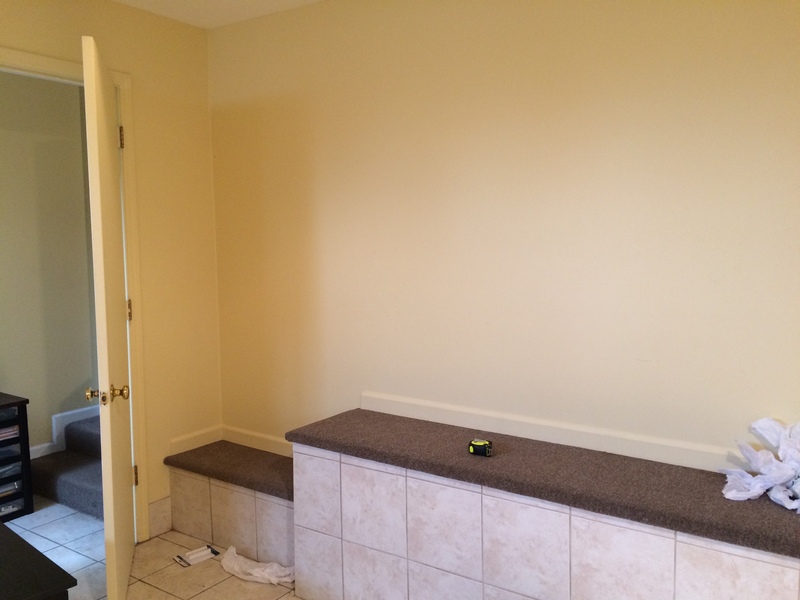 Our solution was to add traditional baseboard on top of the tile along the wall, and to use FLOR carpet tiles on the floor. 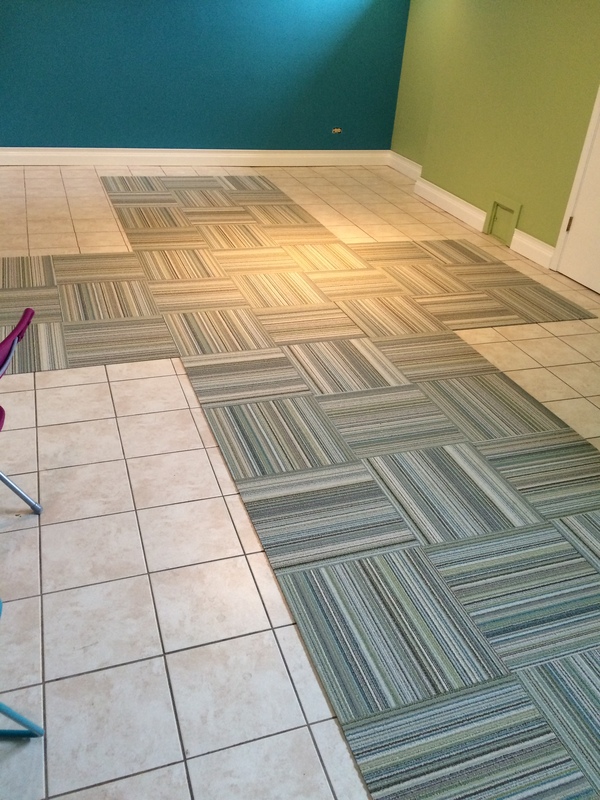 I found this pattern (Fall in Line-Jade) of FLOR tiles on sale (marked down from $13 per tile to $8.49 per tile), so I got a good deal. (Also check the outlet page.) 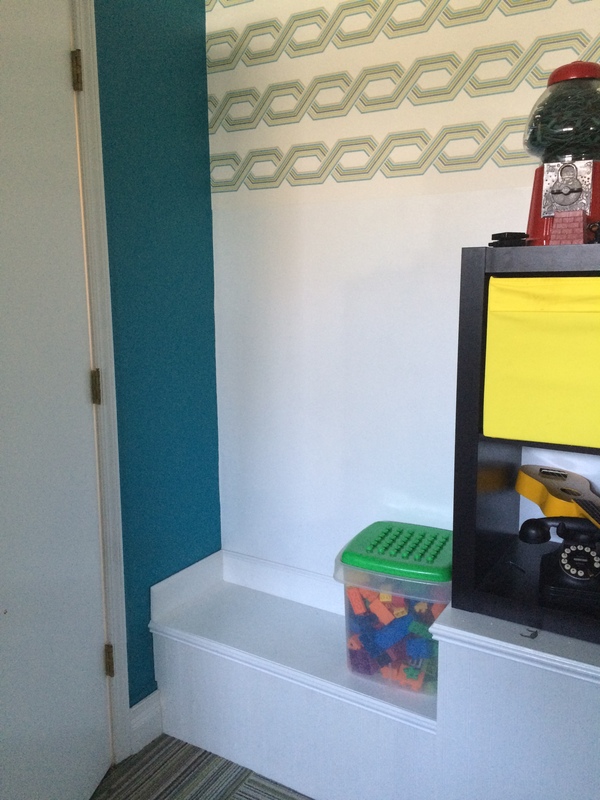 The wall colors were inspired by the stripes in the FLOR tiles. 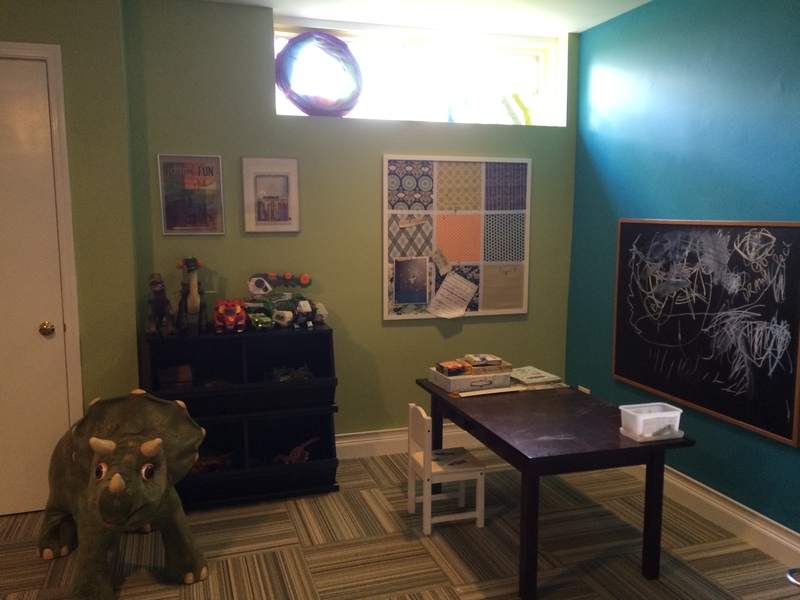 I love carpet tiles for a kid’s room not only for the pattern and color, but also for practical reasons–when the kids inevitably spill, we can replace the affected squares rather than scrapping the whole carpet or living with gross stains. (Be sure to buy more tiles than you need for just this purpose. We have an extra box in reserve.) 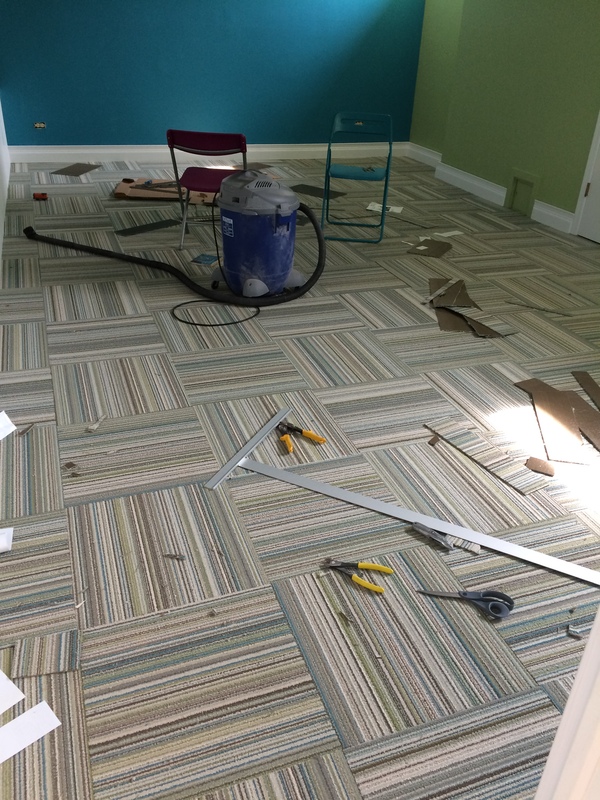 As an added bonus, FLOR is an eco-friendly company–more than 50 percent of the materials in the carpet are made from recyclables. The carpet tiles come with instructions on how to place them so I won’t belabor it here, but essentially you need to start in the middle and work your way to the walls, so that you’re making cuts along the walls and not in the middle. 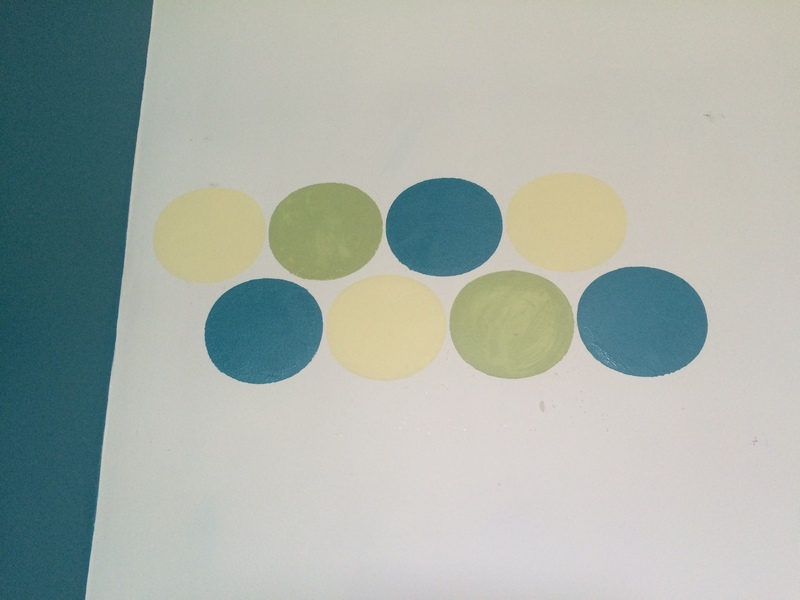 Because this room was a large rectangle, Andy worked his way in a cross pattern, like so. 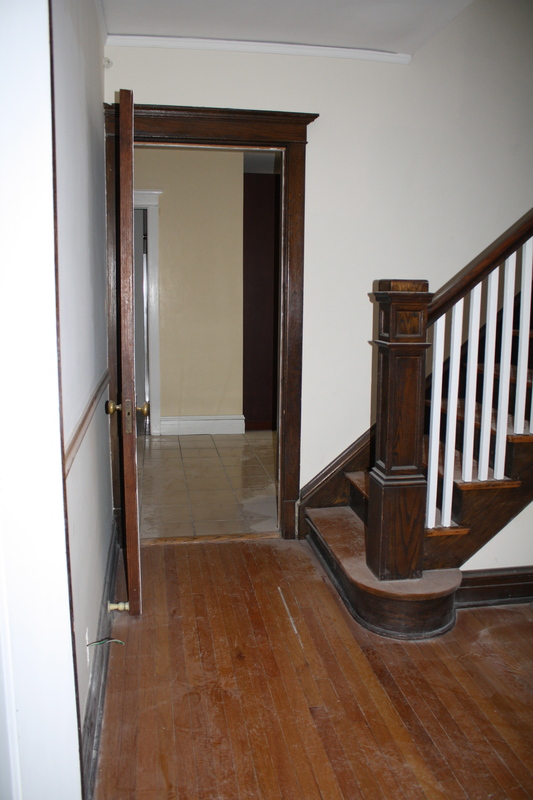 You can see the improved baseboards in this shot, as well as the cuts that still need to be made along the walls. And here it is with the cuts complete. For some reason, it did not occur to me to move all of this crap out of the way before taking the photo. Realism. 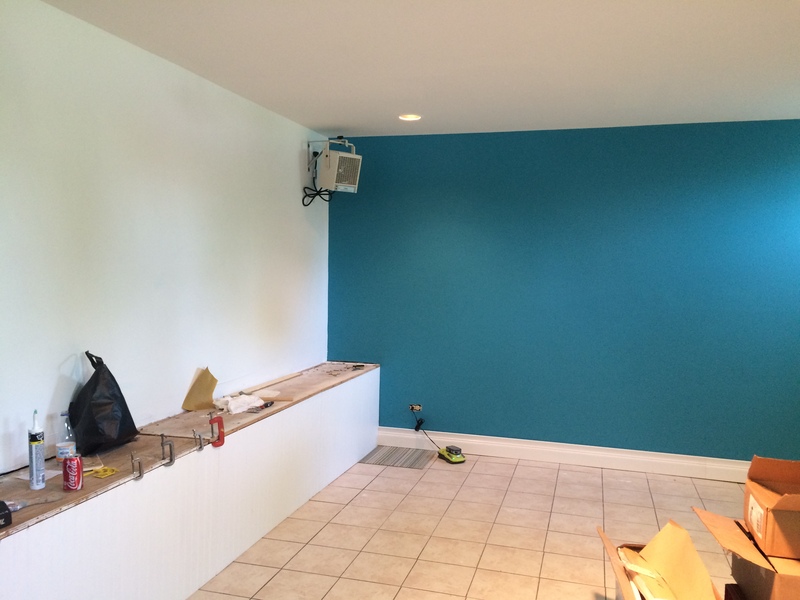 While the wainscoting work was going on, we also painted the basement walls blue and green. 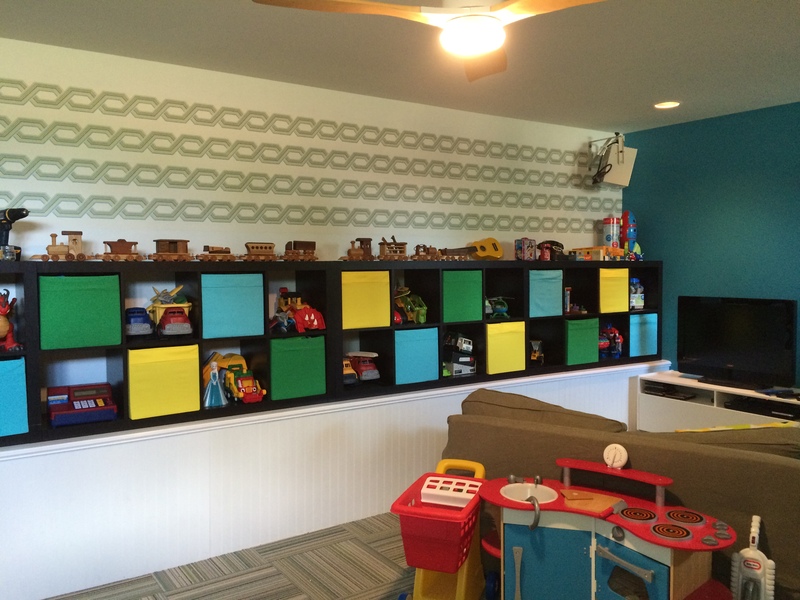 It’s a kid’s playroom so we had license to go a little bananas with color. 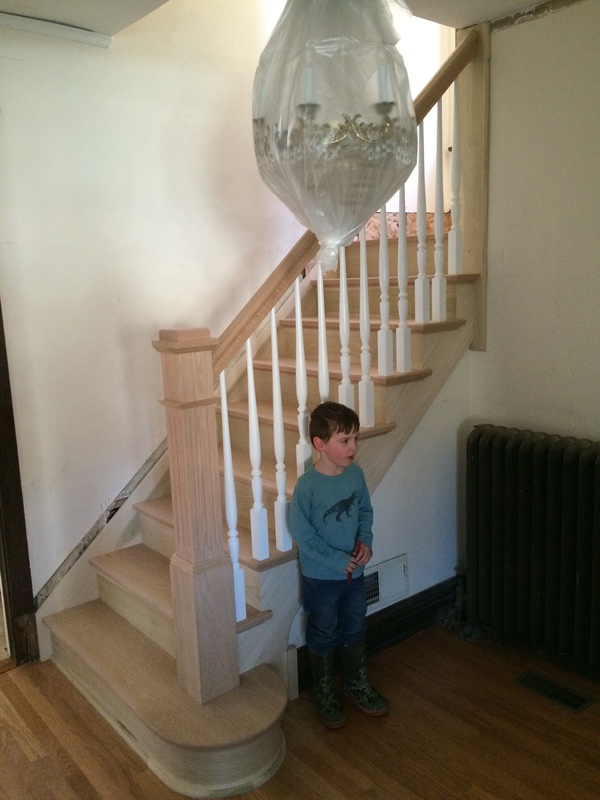 Nobody is inspired to play Halloween dinosaur ghost* in a beige room. *actual game played by my children at least once a week. 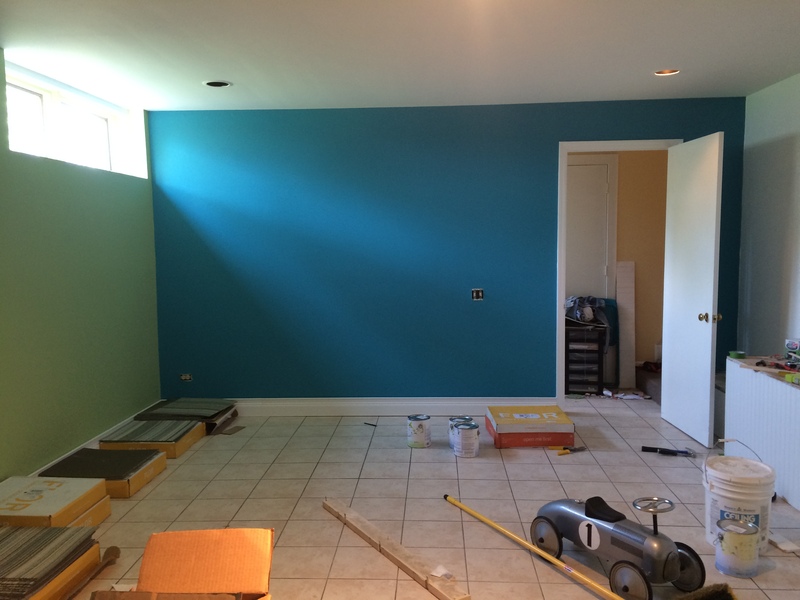 The north and south walls are Meridian Blue by Benjamin Moore. The west wall is painted with Shades of Spring, with yellow Banan-Appeal in the window wells to reflect the minimal light that comes in. 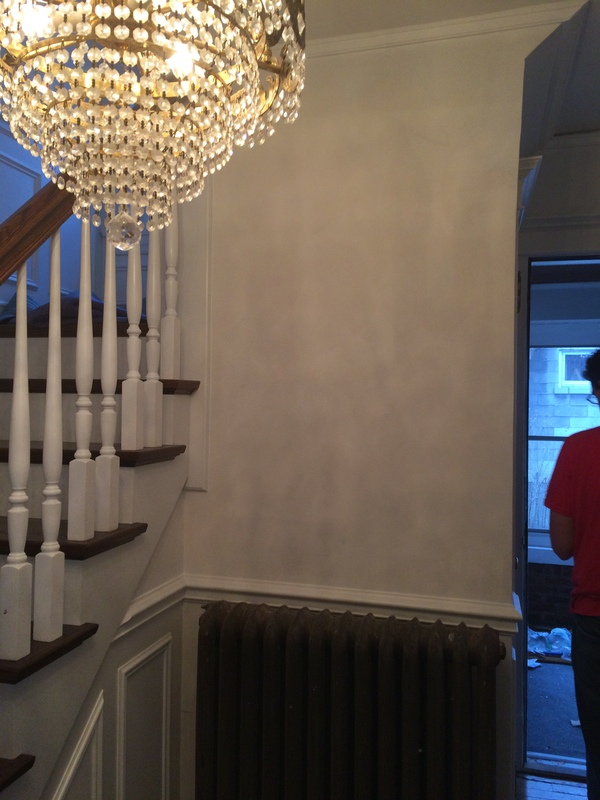 Just a note here because I don’t think I’ve mentioned it elsewhere–we used Benjamin Moore Natura throughout the entire house because I insisted on using zero-VOC paint. 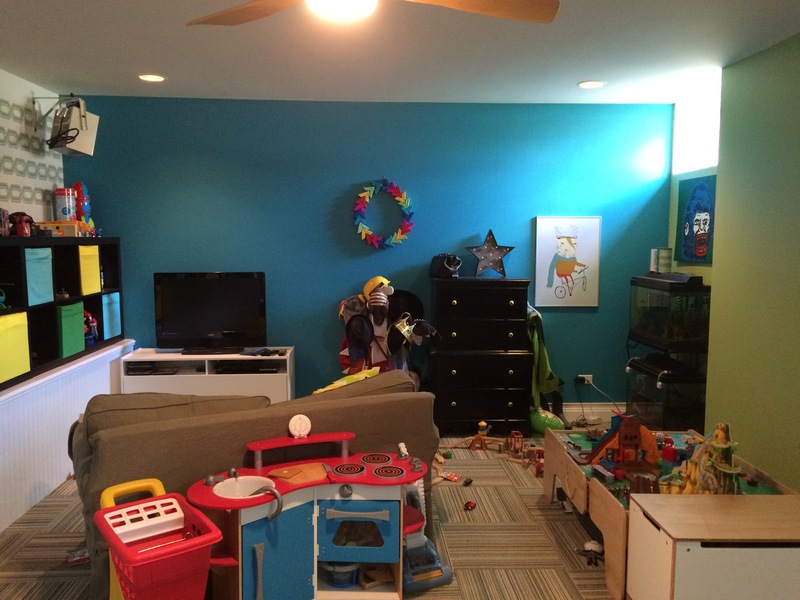 It’s odorless and there’s no subsequent off-gassing so it’s much healthier for your indoor environment–especially important for rooms where kids are going to spend a lot of time. 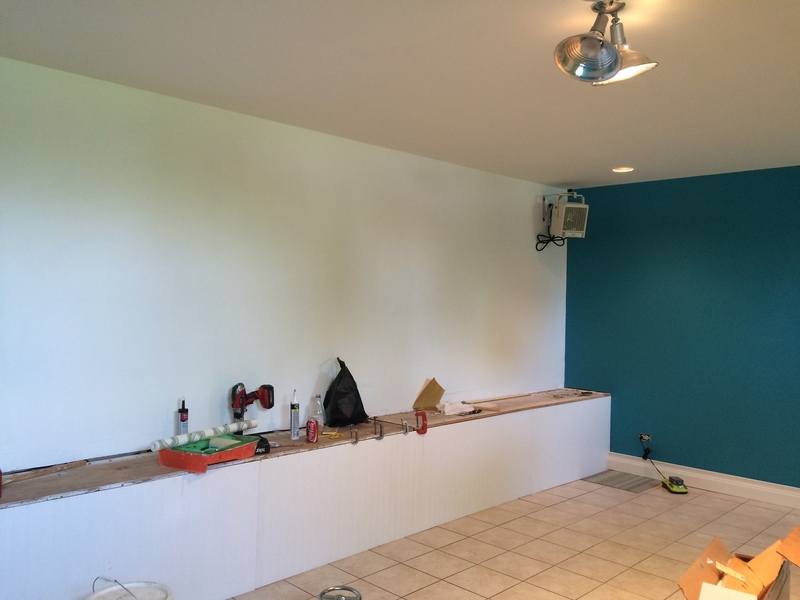 We used low-VOC paint in the past that was a gummy nightmare to apply. Not so with Natura–it goes on like a dream. There’s my pitch. Use it. It’s supposed to be hung vertically but my mom had the idea to run it horizontally along the wall. 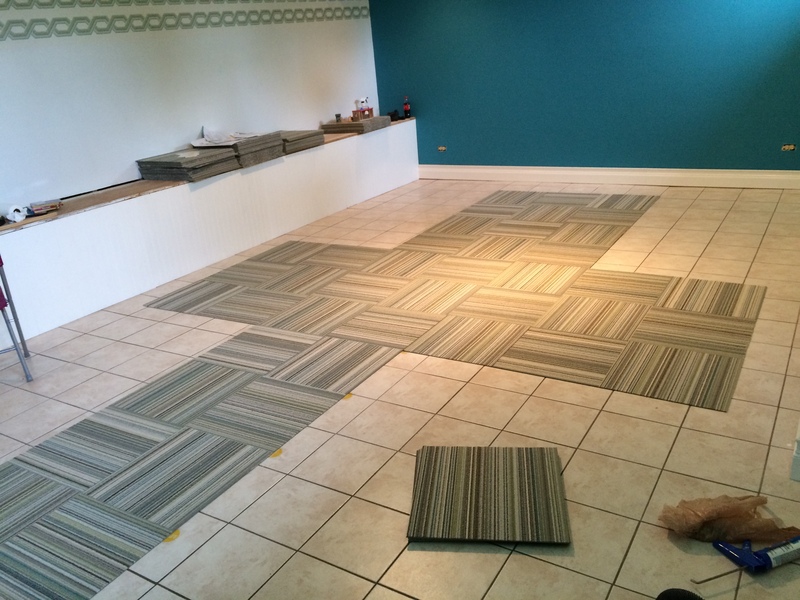 The tile already looks less overwhelming just with this portion covered.